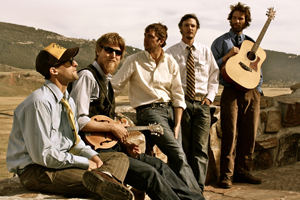 After the circulation in the UK of their solitary studio album to date earlier this summer, the delightfully named Random Canyon Growlers have finally hit these shores to promote their brand of old time/bluegrass music. The five-piece band, currently residing in Jackson Hole Wyoming, have immersed themselves totally in the UK Americana/roots scene with a hectic tour that barely allows them a night off during their couple of weeks stay. They certainly made a good selection with their venue choice while stopping off in Birmingham, as the quaint Kitchen Garden Café, with its brickwork acoustics and intimate environment, has hosted many successful and quality evenings of this type of music over the last few years. The band have undergone a few changes since the recording of …DICKEY AIN’T GOT ALL DAY in 2010 including the moving to pastures new of David McMeekin who contributed a fair amount of original material to this debut release. However founding members Jamie Drysdale (guitar and lead vocals) and Matt Donovan (double bass) are still at the core of the group and, at this moment in time, the quintet is made up of Matt Herron (fiddle), Jon DeGroot (guitar and mandolin) and Brock Benjamin (banjo). Together they are the source of a very tight knit sound that eases through the gear changes of this style of music. While being impeccable interpreters of a sound that has its roots firmly planted in the past, the passion and vibrancy of the guys suggests a healthy future as well. A major change on the evening for those who first discovered the band via the studio album was the lack of numbers from this sixteen-track record featuring in the two sets performed on the night, delivered as usual to a polite and courteous gathering. Yet the decision made to freshen up their playlist from night to night was fully justified with a consistent stream of well constructed versions of tunes made famous by some of the iconic exponents of bluegrass music. There were covers of Bill Monroe’s ‘My Little Georgia Rose’, the Stanley Brothers’ ‘Little Maggie’, ‘Southbound’ by Doc Watson and ‘Baltimore Johnny’ by the Del McCoury Band. All artists very much at the frontier of the evolution of bluegrass music. The band also paid tribute to some of the modern trailblazers with Jon DeGroot taking over lead vocals for versions of ‘Red Clay Halo’ by Gillian Welch and Steve Earle’s ‘Hometown Blues’, while regular vocalist Jamie Drysdale gave a fine account of ‘Blue Trail of Sorrow’ by Alison Krauss. With Matt Donovan holding the band together with his rhythmic double bass playing, his namesake colleague, Matt Herron had ample opportunity to showcase his talents with a host of fiddle tunes including ‘Red Prairie Dawn’ and one originating from north of the border ‘Flower of Edinburgh’. The absence of banjo player, Brock Benjamin for the first set is probably best not dwelled upon but his arrival heralded a more complete sound, added harmonies on numbers such as the self penned ‘Afraid to Go Home’ and led the band in a version of the Bela Fleck instrumental ‘Whitewater’. The value for money near two-hour long show was brought to its conclusion with a final encore version of the popular ‘Country Roads’ which, as expected, saw the invite for some crowd participation actively received. The whole experience was a lot more country than the version introduced to the UK nearly 40 years ago by the controversial CMA Female artist of the year Olivia Newton John. Hopefully the band will have generated enough interest during this UK trip to warrant a future visit and thus not leave them as an act with a memorable name that we only saw once.